Olive oil is described in both weight and volume. It's also sold in both english and metric sizes. Comparing both your pricing and packaging apples to apples can prove quite difficult because of this. 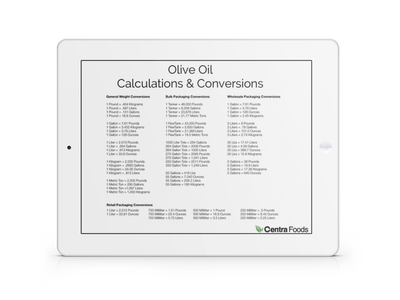 That's why we've created an Olive Oil Calculations & Conversions cheat sheet-- a list that provides all of the math and calculations you'll need to compare different sizes and pricing given in different units. Save this math cheat sheet for all of the pricing and packaging comparisons you may need to do in the future. To download, fill out the information boxes to the right and click Download Conversions Sheet.